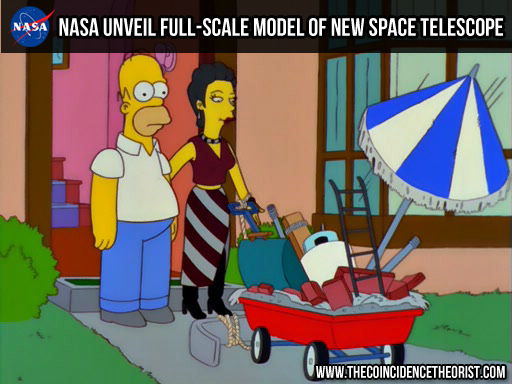 You are here: Home / BLOG / Space / Are You Ready For NASA’s Cutting-Edge New Space Telescope? Don’t let its laughable appearance fool you; NASA’s James Webb Space Telescope (JWST) is set to achieve great things. Utilising infrared astronomy, scientists will use the 8.7 billion dollar JWST to ogle deep into space with the aim of unlocking some of the fundamental mysteries of our universe. By 2018 the JWST will be launched 1,500,000 kilometres into space, remaining completely unaffected by radiation exposure and extreme fluctuations in temperature, and will fly around taking pictures of unparalleled sharpness and quality. Of course only government space agencies will have access to this supposedly game-changing piece of equipment and therefore the general public will have to apply blind faith to any findings it produces… But surely government organisations wouldn’t lie to us about anything!